An X-ray is a quick, painless medical imaging test that produces images of the structures inside of your body — most often to view your bones. X-rays are a common imaging test that uses small amounts of high-energy electromagnetic radiation to produce images for doctors to view the inside of the body. The level of exposure is considered safe for adults. It is not considered safe for a developing fetus so it is very important that a pregnant patient informs a physician of their pregnancy before having an X-ray taken. X-rays pass through skin and soft tissue mostly, but do not pass through bone or metal easily. As different tissues in the body absorb different amounts of radiation, the images will show different shades of black and white. One of the most common uses of an X-ray is to check for broken bones after an accident, but they are also used under many other circumstances. X-rays are used to identify, diagnose, and treat many types of medical conditions. 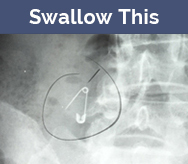 It is a key element and often times the first to be done in the diagnosis process. Why would someone need or get an x-ray? What is getting an x-ray like? What are the costs of an x-ray? How are x-rays different than MRI or CT scans? From Ivan Pulyui's very first vacuum discharge tubes in 1877, to the most recent advancements in the field, see the timeline of how it all happened. Our timeline and historic photos present a quick overview. 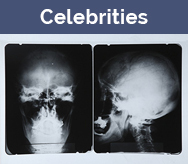 See what's on the inside of these celebrities. Literally. 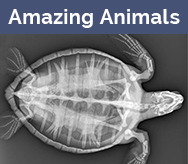 See what some amazing animals look like through xrays. 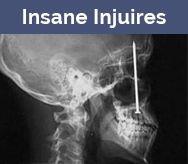 You won't believe some of the things found inside human bodies. Just looking at some of these xrays hurts. 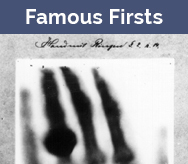 World's First Xray Showed Some Major Bling. A trusting wife shows off her rock.